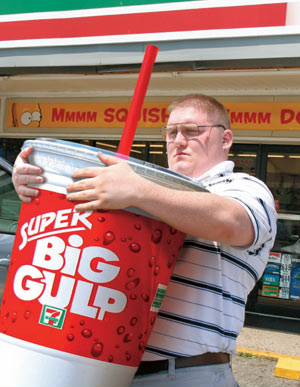 New York’s Big Gulp ban, on the other hand, regards a wholly artificial liquid, spiked with corn-syrup and chemicals and served in paper tureens. Soft drinks have found to be responsible, in part, for the obesity epidemic, soaring cases of diabetes and a host of other lifestyle-related diseases that threaten the lives of far more than five people a year. One third of adults in the U.S. are obese; one in twelve has diabetes. And yet Americans are so shot through with a belief in individual freedom and choice that they see government intervention in their diets as an affront to their civil liberties— in effect, they defend their right to eat themselves to death. But what if people have become fatter not because of their own personal choices, or even a collective failure of willpower, but rather as a result of specific government policies and politicians’ complicity with an ultra-powerful food lobby? Would they feel somewhat differently if they knew that the obesity epidemic is actually the government’s fault? As this article in the Guardian explains, the explosion in obesity rates coincided with the proliferation of high-fructose corn syrup (HFCS), sanctioned and encouraged by the government as a convenient way to deal with corn surpluses after Nixon initiated production of the crop on an industrial scale. HFCS was injected into everything—bread, meat, salad dressing—unbeknownst to consumers. It was cheap, palatable; it replaced the flavour of oil and lard in food when the misguided low-fat diet craze swept in. But high doses of fructose are toxic, according to a growing number of scientists, who say it is also the culprit behind heart disease, hormonal disorders including diabetes, cancers and other degenerative diseases. It causes fatty liver, just like overconsumption of alcohol. It makes you insatiably hungry. And, worse of all, it is extraordinarily efficient at stimulating fat gain, particularly around the belly, as well as sending hormones such as insulin and leptin haywire. 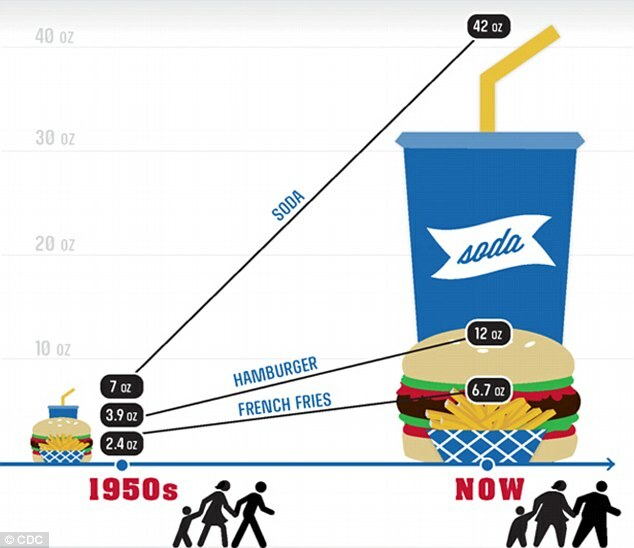 As we ate more fructose, our appetites expanded, and so did portion sizes. And so we got fatter. Again, many would prefer to see this as an aspect of free choice: if you want to eat less, just eat less! But even those with a will of steel consume more when faced with more. Studies have shown that people will pronounce themselves satiated to the same degree even when they eat vastly different amounts of food if they have been led to believe the amount is the same. As hungry animals biologically wired to consume as much fat, carbohydrate and salt as we can to help us through times of scarcity, we are pretty easily duped. The problem is we now suffer from excess, not scarcity. It was the initiative of restaurants and food manufacturers, not customer clamouring, that brought larger meals and drinks into existence. Just as no-one imagined that they needed, say, a Rubik’s cube or a SodaStreamer in the 1970s, no one was crying out for a bucket of sugary liquid. But once it was served to them, they lapped it up—and wanted more. Marketing means products don’t just answer needs; they create desires. Assertions about moral paternalism in the context of obesity and diabetes epidemics are absurd. The accusations of moral paternalism leveled at Bloomberg reveal a contradiction in the American ideology. Libertarians loathe governmental control because it removes what they see as capitalism’s greatest virtue: the provision of choice. Big Business, on the other hand, supplies choice, which is why libertarians have such a curious blind spot when it comes to corporate control and manipulation of human desires. How do they manipulate us? By tinkering with recipes until they find the exact cocktail of sugar, fat, salt and chemicals to tickle our primal hunger for their substances, and yet leave us unsatiated and wanting more. Sugar is addictive. This doesn’t mean we don’t have the free will to refuse it; it just means that it is harder to do so. We don’t need to get into the murky debate of whether addicts have free will or whether they are powerless in the face of their addiction; it is clear where the responsibility lies when you see the correlation between a growing abundance of high-sugar foods and larger portions, and a rocketing rate of obesity. Moreover, you cannot have free choice if you are not in possession of all the facts—as we are not when sugar lurks in the most unlikely of foods, such as sausages, cheese, and pasta—or when you are kept in the dark about the health consequences of sugar because powerful food lobbyists have suppressed all negative news about it. What if, rather than trying to nanny New Yorkers, Bloomberg is merely trying to correct years of government policy that has not only failed to legislate against a toxin responsible for many more lethal diseases than cigarettes, but has encouraged its proliferation? It’s tragic that while Michelle Obama is planting vegetables in the White House’s garden and doing press-ups on television to combat childhood obesity—one in three American children is overweight—her husband and his government remain beholden to some immoral and extremely powerful lobbyists that allowed pizza to be declared a vegetable by Congress, which also scrapped a plan to reduce sugar, salt and fat in food marketed to children due to pressure by influence groups. In a previous post about Fukushima I noted that people are happy to drink themselves to death or smoke their lungs out, because in their own warped calculus the pleasure from a vice they chose is worth dying from. But if someone dies of something through no fault of their own, or worse, because of some bureaucratic incompetence, then they’re outraged. By the time people realise that the government has encouraged their ill health through the sanctioning of toxic ingredients, or the government finally tries to reverse the tidal wave of sickness its own policies caused, having realised the social and economic costs, it will probably be too late. Excellent article Sophie. It’s ridiculous that a good percentage of us know that we’re being sold down the river in an ever larger canoe, but still find it really difficult to restrain ourselves from buying and consuming foods that are bad for us. Food is so fundamental to our lives in a way that tobacco and alcohol can never be that it’s almost impossible to only eat foods that are good for us. The killer is eating foods we think are healthy – salads, cereals, cheeses etc. – to discover that we’d be better off eating a bowl of sugar. Eventually, as with tobacco (and ever so slowly with alcohol) something will be done, but future generations will look back and wonder why it took so long for sense to prevail. Go Bloomberg! Actually, perhaps one of the great things about his move is that it’s sparked absolutely loads of debate on the issue. The irony is that here in the UK, we are charging on ahead with the absurd sponsorship of the Olympics by food and beverage companies that sell exactly the kind of thing that is not conducive to health, while our government is too scared to make the kind of bold moves that Bloomberg has.